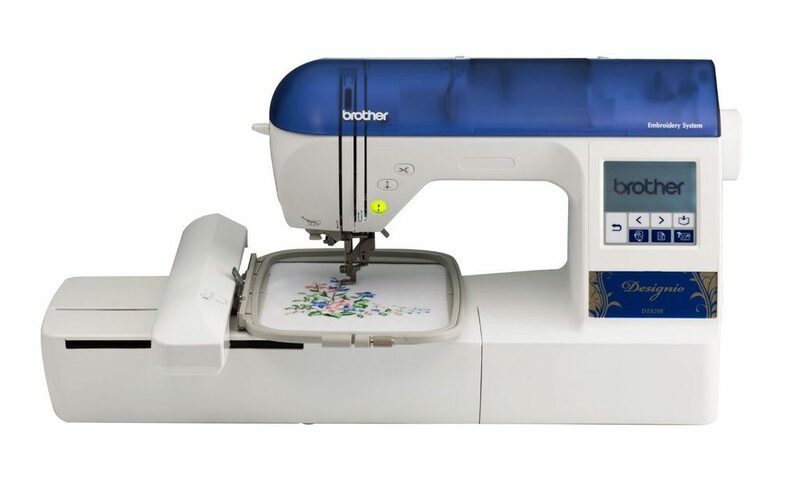 The Brother Designio DZ820E embroidery machine is another great Brother product, perhaps the ideal gift for anyone who wants to get into embroidery. This is another beginner-friendly model, rich with built-in tutorials, fonts and designs. Ease of use is what characterizes the DZ820E and the product comes with a wide range of useful accessories. Clearly, this is a machine meant for beginners who want to enter the world of embroidery. This shows in the design, the performance and, thankfully, the low price. The large embroidery area (maximum field of 5 x 7 inches) is what instantly stands out about this product. Rarely do we ever see a machine within this price range with such a large embroidery area. Typically, a 4 x 4-inch area is expected in machines like the DZ820E. Right off the bat, this is a great sign – even the most inexperienced of users can work on larger projects. Also, the size is not set in stone – three different embroidery frames are included (5 x 7, 4 x 4 and 2.5 x 1 inches). Aesthetically, this is not a model that stands out. The slightly unusual color scheme might be a surprise to some and with the dimensions of 16.77 x 21.26 x 17.28 inches (L x W x H), this is not exactly the smallest embroidery machine on the market, but it is definitely small enough to still be considered pretty portable. 136 embroidery designs are built-in, but 200 more are available on the included CD. Of course, the user can simply download more designs from the internet and transfer them via the USB port, which means the memory function of the DZ820E might definitely come in handy at some point. Additionally, there are 6 built-in fonts and the pattern can be rotated by 1, 10 or 90 degrees. The exclusive Brother Quick-set drop-in bobbin is another beginner-friendly feature, as it helps ensure the bobbin stays in place. This innovative little feature is absolutely perfect for fine sewing. It wouldn’t be fair not to mention at least the most important accessories that come with the DZ820E. To name a few, included with the product are: an embroidery starter kit, a dust cover, 3 embroidery hoops, CD with 200 designs, a bobbin thread, scissors, three spool caps, two screwdrivers, a seam ripper, 3 needles, 4 bobbins (1 on the machine) and a cleaning brush. The user manual is well-written, easy to read and available in two languages – English and Spanish. All in all, regarding design and functionality, Brother are again on point. They’ve made another user-friendly machine that comes across as quite sturdy and stable. Of course, the nice warranty deal (2/6/25 year premium deal) also helps. “Start embroidering right out of the box!” is the official Brother’s slogan for this product and it pretty much shows the intent – this is a very beginner-friendly model, an entry level embroidery only machine. The back-lit LCD touch screen display (dimensions: 1.4 x 2.7 inches) is traditionally present and it allows the beginner to view built-in tutorials, as well as access design editing features. Just like it is the case with previously released Brother models, the display is intuitive and easy to use. The work area is brightly lit, which makes working on dark fabrics much easier than it is the case with some embroidery machines out there. The only downside is – it’s pretty small, so viewing the tutorials and editing the designs might require a little more effort than the average beginner would like. This might not be a deal-breaker, but it is certainly an inconvenience. Producing 650 stitches per minute, the DZ820E can be considered a fast machine. In fact, it’s safe to say that it is faster than most embroidery machines within the price range. This, however, does not make it overwhelming for the average beginner. 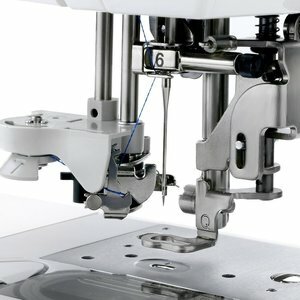 The DZ820E is very easy to use and has dozens of automated features, making it one of the best performing entry-level embroidery machines we’ve ever reviewed. Considering the price, this is the best embroidery machine someone on a fairly limited budget can afford. 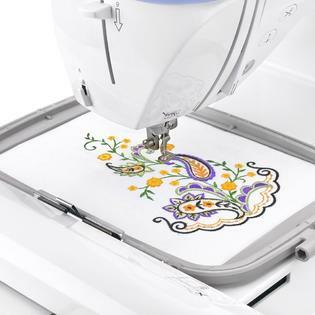 Accessories, the large number of built-in designs, tutorials and everything else, all together, makes the DZ820E one of the best beginner embroidery machines available today. Amazon have a great offer on this model with tons and tons of extras. The other links on this page take you to the machine without the add-ons, so here’s a link to the one with extras.